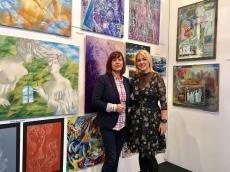 Azerbaijani artists took part in the International Salon of Contemporary Art in Italy. The national artists were invited to join art event by Passepartout Unconventional Gallery and curator Elena Ferrari, Trend Life reported. Asmar Narimanbayova acts as a co-curator and participant of the stand, where the works of Azerbaijani artists are represented. The exhibition includes works by Azerbaijani artists Rena Amrahova, Aysel Mirgasimova, Asmar Narimanbayova, Elnara Safarova, Leyla Aliyeva and Lala Agayeva, as well as Turkish artist Kamran Muzaffer Gendzher. The art event received wide acclaim. The works of national artists caused a great interest of art connoisseurs. Asmar Narimanbayova was born in a family of eminent artists. Her father Togrul Narimanbayov, was world-famous Azerbaijani artist, while her mother Elmira Huseynova was a sculptor. Asmar grew up in the atmosphere of love to art, music and literature. She is an artist full of light, wide and enthusiastic soul. While creating works in different styles starting from fauvism to impressionism, then from postimpressionism to cubism and expressionism, the artist has found her individual creative manner of the letter, the original color sensation acting as a composition dominant. She has been characterized for her bold and engaging style.